It’s a Classic Space Adventure! Christmas Dinner is now just a fleeting memory, the presents are all unwrapped, and it’s cold outside. What you need is a classic video game. Fortunately we have one, thanks to the brilliance of Flickr’s Johan Alexanderson (aka Jalex), who has created a marvellous pixelated Classic Space adventure game that uses many of LEGO’s Classic Space sets and is free to play! Take a look at the trailer for Jalex’s ‘Classic Space Adventure’ via the link above, and then click the link below! Play ‘Classic Space Adventure’ Here! This is not a car. Not even close. But it is really cool and we like Classic Space, so here it is. Built by Flickr’s Kloou in collaboration with two other builders, this 1.2metre tall tower finally gives the humble Classic Spacemen a base of their very own. 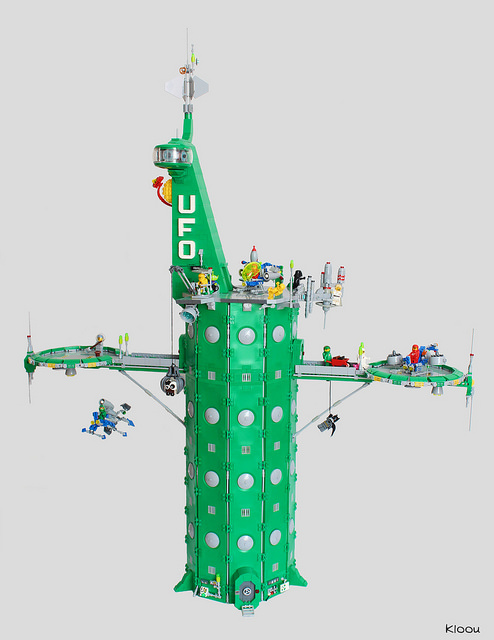 Constructed using the baseplates from LEGO’s long-forgotten Soccer range, Kloou’s monument to classic space is an impressive feat of engineering featuring a variety of spacecraft and other vehicles, and is also packed with easter eggs. Head over to Flickr via the link above to climb the tower, and see if you can spot Darth Vader and Luke’s famous scene, the three-eyed alien from Toy Story, and Batman amongst the classic spacemen. This retro-tastic creation was discovered by one of our Elves on Flickr today, who returned to the office to collect a meal and a Smartie. Built by TLCB favourite billyburg and sharing your Dad’s nickname from his disco days, this ‘Cosmic Cruiser’ blends science fiction hover cars with ’60s land-yacht styling, and adds a Classic Space paint job to glorious effect. Head over to billyburg’s photostream to dance like your Dad. 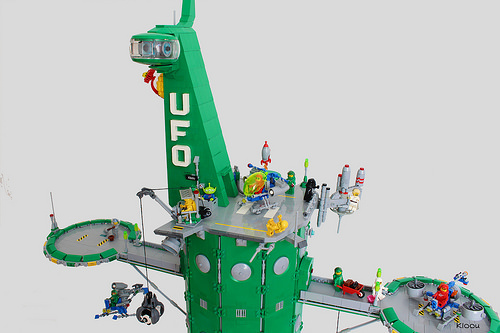 We don’t often publish sci-fi builds here at The Lego Car Blog. This is mostly because we’re a Car Blog, but partly because we understand sci-fi about as well as Kim Kardashian understands plumbing. Today though, we are posting about sci-fi – and we do understand it – because this kids, is Classic Space! Classic Space (or just ‘Space’ at the time) was LEGO’s hugely successful sci-fi theme in the 1980s. Colours were blue, grey and trans-yellow, missions were exclusively science and exploration – never conflict, and everyone was always smiling. Sadly the theme ended before this TLCB Writer was old enough to walk, but it paved the way for such gems as Futuron, M-Tron, Blacktron and Space Police. Today though, we’re remembering the original, thanks to Jon Blackford’s wonderful Neo Classic Space Hanger. Complete with an LL221 spacecraft, a variety of classic space vehicles, a multitude of classic spacemen, and some beautiful-looking blue lighting, Jon’s build is the prefect homage to LEGO’s long-dead theme. It uses some truly brilliant building techniques too that are well worth further investigation. Take a look for yourself at Jon’s Flickr album and via MOCpages. Apparently this is a Utility Platform Vehicle (UPV), and it appears that can perform more functions than a Swiss army knife. A spacey Land Rover Defender if you will. Only probably more reliable. It’s the work of Flickr’s ZCerberus and you can check it out in various configurations by visiting his photostream. Click the link above for all the images. Because who wouldn’t want a giant mechanical lunar elephant? Exactly. No-one. Head over to David Alexander Smith‘s Flickr photostream to show your appreciation! This lovely Classic Space workshop scene comes from Flickr’s Jon Blackford, depicting our favourite smiling spacemen hard at work doing whatever it is that Classic Spacemen do. Jon has supplied the colourful mini-figures with a variety of suitably weird and wonderful vehicles to aid them in their mission; start your journey into Classic Space and check out all of their contraptions via the link to Jon’s photostream above.